Hetraco again at Offshore Energy fair - Hetraco B.V.
After a very successful 1st participation in 2016, we decided to be present again at this wonderful event in 2018! Offshore Energy focuses on the technical, operational and commercial challenges related to the future growth sector. The two-day event includes an exhibition where more than 650 supply chain companies are expected to present their products and services. In addition, there is an accompanying conference that covers important topics and solutions for the offshore community. Offshore Energy is the fastest growing meeting of offshore industry professionals. Founded in 2008, the Offshore Energy records breaks year after year. The 2017 edition attracted more than 12,000 unique visitors representing 90 nationalities. 26,000 square meters of trading floor. Exhibitors, visitors and conference participants from more than 90+ nationalities. Come and benefit from the expansion of Offshore Energy. Meet new customers and partners, as well as strengthen your relationships with existing customers. Discover best practices and new developments. Whether you are interested in doing business in Europe, looking for European partners or promoting your global presence. Let Offshore Energy be your platform for the future! 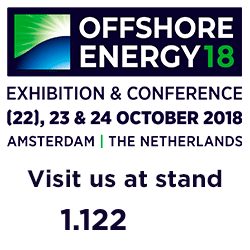 We look forward to welcoming you at the Offshore Energy 2018!